Challenge your Club members with a fun game of coordination – that also happens to dramatically improve their math skills and processing speed! Mathquest is a set of patterned ball activities that combine choreographed hand and foot movements with computerized math lessons. The program achieves significant growth in basic math skills in just 20 total hours of training. Our schedules are customizable to your Club’s needs. The Mathquest Adventure Guide staff member spends a few minutes setting up the tablets and speakers, then hands each Club member a training ball and starts the daily lesson. The lesson leads Club members through a math patterning sequence using specifically timed hand and foot movements. The timed movement to a beat and patterning sequences are critical pieces of the program. Next, the Guide leads Club members through a series of practice calculations that teach them how to quickly add or multiply. Interactive math games round out each lesson. When your Club signs up for Mathquest, we send you all the equipment you need to run it. Your Club selects one staff member to serve as Adventure Guide, and we train the Guide in how to run the program via online training sessions. Club members in grades 2 – 6 are the main target group. Mathquest is highly versatile – it can be done in any space where a speaker can be set up and balls can be bounced. The program is easy to set up at the beginning of every session, and to put away at the end of every session – a dedicated space is not required. Each session takes 25 – 30 minutes. Sessions can be offered as many days per week as a Club wants: two, three, four, or five days per week. How does staff training work? The dedicated Club staff member is trained by a credentialed teacher and Hardy support staff who serve as trainers and resources for helping the Club develop strong educational practices. 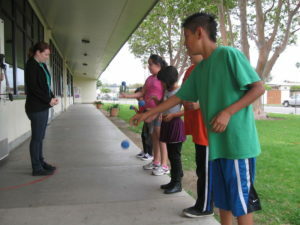 These teaching techniques are to be used during the program and are beneficial if used during other academic teaching opportunities such as Power Hour. This training is also offered to Club directors, board members, program managers, and other staff who will be helpful knowing about or running the program. Hardy staff is available daily via email, phone, and text to address any need that arises and guide the Club staff in working with club members. Trained staff have access to the Hardy resource website which houses all necessary program and training information at their fingertips. Hardy staff oversees testing before and after every training to assess Club members’ progress. Club members typically gain many months growth in math and processing speed during the program. Want Mathquest in Your Club? A patterned game of dexterity and coordination! We send you everything you need and train your staff. The schedule is fully customizable for your Club, and it fits easily into even small spaces!